Just wanted to give a quick update on some cool stuff we wrapped up today. It hits all the beats we try to cover when designing features for the game. 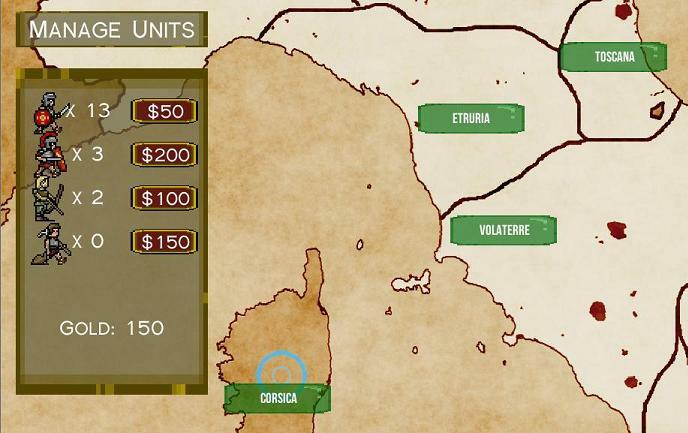 It’s interactive, it’s fun, and it fits within the Roman setting we’re trying to create. Also, it ties into our crowd funding effort which is going to start pretty soon over at KickStarter so that’s an added bonus. So what is it already! God, quit rambling. 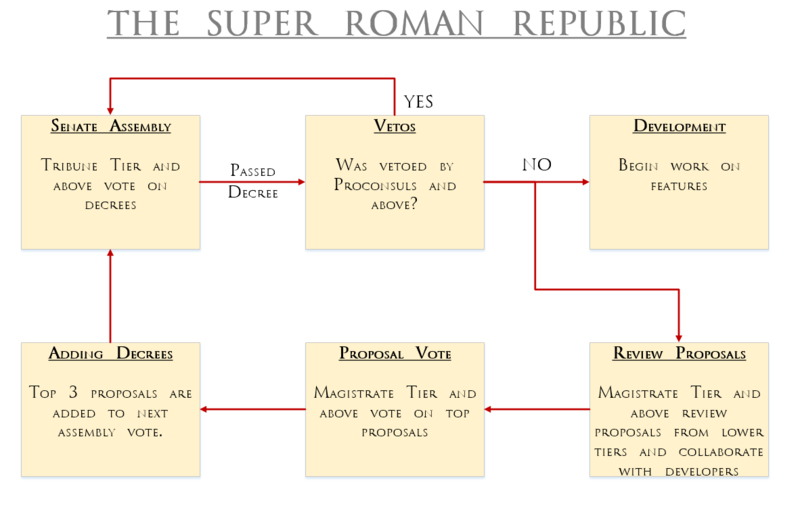 We’re using a modular development model for Super Roman Conquest. We’re going to have around 10 different game features shown on our KickStarter page when we launch. Now, these aren’t stretch goals. Stretch goals are a different topic for a different post. Rather, these are features that we’ve come up with that we think would be an great addition to the core gameplay of SRC. With all that in mind, we began developing the concept of Senate Decrees. These handful of decrees would be displayed on the KickStarter so that fans would know what we had planned for the development of SRC. We wanted backers of the project to have some influence on these decrees, either by voting on their favorites, or coming up with entirely new decrees. In order to interface with backers, we set about building in a very simple form of government right into our KickStarter reward tiers. Depending on which tier the fans want to get in on, that’s how much influence they wield in the Senate Decree system. This way, fans who are extremely into the real-life meta game of influence, and who want to get involved, can sign up to higher reward tiers. Lower reward tier backers still have a voice in the course of development. Real quick, of course everything is subject to change here. This is, after all, a development blog and things in development change as we all know. Ok, now that I got that out of the way here’s a quick and dirty picture I drew up. In this system, the lowest voting member of the community is a TRIBUNE. Tribunes will get a special flag on the forums and will be able to participate by voting with their fellow senators on any of the 10 Senate Decrees we’ve already come up with. But that’s just at the beginning. After the Senate Assembly vote is tallied, the vote moves on to a possible Veto stage. Here, high ranking members of elite PROCONSUL reward tiers will have a chance to veto the decree passed by the assembly. To prevent a full government shut-down (so timely…) each PROCONSUL member can only use their veto power once. If a decree is vetoed a new vote is taken and no decree can be vetoed twice. Moving on, if the vote is NOT vetoed it moves on to us, the developers. The 3 decrees that received the least amount of votes will be taken off for the next assembly. After that we’ll begin work developing the feature and work as quickly as possible to get it done and get it done right so that we can continue this process. In the meantime, members of a middle MAGISTRATE reward tier will get to work digging through the forums and talking to their constituents in the lower tiers. The hope is to make this like a true republic where larger lower tiers are represented by senators with their constituents priorities in mind. Backers in the MAGISTRATE tiers will also have special access to us, the developers. We will check in with these patrons often to find out what the fans want put forward for the next assembly. Once the magistrates have assembled an adequate list of decree proposals, we’ll gather them into a list and conduct a special voting round for backers in the MAGISTRATE tier and above. This voting round only includes members in the magistrate tier and above and will decide which 3 of the proposals will go on to become Senate Decrees in the next assembly. After all the votes are tallied and the top three proposals are made decrees for the next vote, a Senate assembly will be called and the entire process repeats itself. Well, I know that is a long post and there’s certainly a lot to digest there but I hope you at least get what we’re trying to accomplish with this system. Feel free to message us with any questions or ideas. So this is one of the first screens you’ll see during this campaign. I’ve put a rudimentary unit management screen on the map as well, where you can purchase and upgrade units, and requisition new equipment. Expect this screen to contain a lot more sub-menus and buttons as we pack in more customization to the campaign. At this point, you can scroll around the map, zoom into areas, plot your campaign route, and engage the enemy. Next step is to add the additional customization menus, and nail down an appropriate campaign length for this region. Til next time!